There are few things on this planet I hate more than bottled water. Just the crinkling sound of someone wrapping their mouth around one of those squeaky garbage accordions fills me with rage. I stopped drinking it a long time ago—and you should stop drinking it, too. 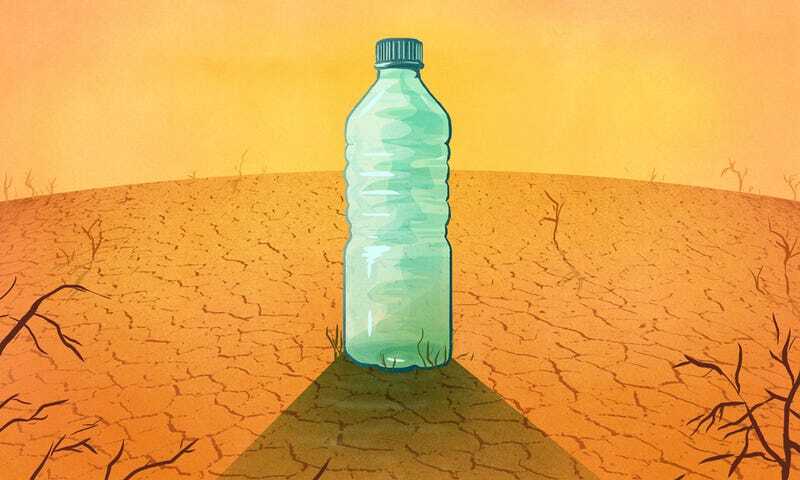 In 2015, in the midst of a major drought in the Western US, Nestlé’s CEO pissed a whole bunch of people off when he said he would not stop bottling water at the company’s California plant, not too far away from where people’s wells are running dry. In fact, he would bottle more if he could, he said, because Americans just can’t stop buying it. In response, people began tweeting this page from Nestlé’s site of all the bottled water brands to boycott. Great, boycott all those. And all other types of bottled water, too. A 2016 study from Washington University in St. Louis, which banned bottled water seven years ago, actually found that the sale of all bottled beverages dropped nearly 40 percent after the new policy was implemented. But don’t boycott bottled water because of one drought specifically. Or because Nestlé or any other company is profiting from water that actually belongs to fish or almonds or other humans—although to be honest, we actually don’t know how much water they’re stuffing into those ribbed sleeves because that information is protected by the state’s government. Clean, safe drinking water that flows freely out of our faucets is a feat of engineering that humans have been been perfecting for two millennia. It is a cornerstone of civilization. It is what our cities are built upon. And over the years the scientists and hydrologists and technicians who help get water to our houses have also become our environmental stewards, our infrastructural watchdogs, our urban visionaries. Drinking the water these people supply to our homes is the best possible way to protect future access to water worldwide. Even after public water crises like Flint—especially after public crises Flint. Companies that package water in a single-use bottle are not concerned with the future. They are not invested in the long-term effects of climate change on an endangered watershed, nor are they working to prepare a megacity for an inevitable natural disaster. What they are interested in is their bottom line: Marketing a “healthy” product to compensate for the fact that people are buying less of their other products that are known to cause obesity and diabetes—and selling it at prices that are 240 to 10,000 times higher than what you pay for tap water. Drinking municipal tap water means connecting yourself to your local water system, where the goals are to think holistically about the conservation of natural resources, replenish local aquifers, and build a resilient infrastructure to distribute water to the public. Drinking bottled water means colluding with a corporation which is not required to release any public information about how it plans to cut costs, exploit workers, dig wells, or employ a fossil-fueled supply chain in its quest to get a bottle of overpriced water into your hands. Not that our current water system doesn’t need an upgrade. Drinking fountains, for example, are the great neglected infrastructure of our cities. Once an amenity found on every corner, these miracles of modern life lapsed into disrepair. It’s not just in parks and other public areas—many schools decided it was too expensive to replace old pipes, so they ripped out their drinking fountains instead, forcing kids to buy bottled water. Turning these urban springs of fresh water into tiny altars of awareness can make water access top of mind—and provide a better public service. Last week Los Angeles declared Tap Water Day, celebrating the design of its new “drinking stations” and a new app that’s hoping to map and eventually overhaul all of the city’s fountains. Maybe that’s how we get people to start appreciating the role of water in our cities—by improving our most visible water supply out in public. But we can’t stop at the municipal level. We have to think bigger. Eleven percent of the Earth’s population does not have access to safe drinking water. There are people in this country who are currently facing a groundwater contamination crisis. Instead of throwing our Great American Problem at people by the plastic-encased-in-plastic case, we should be focusing on designing and building comprehensive, permanent water systems for every person on this planet. Each bottle of water purchased is a vote against that goal. Giving up bottled water also means thinking long-term about preserving water security. You may have reservoirs near you brimming over with fresh rainfall right now, but the truth is that the amount of potable water on this planet is growing more scarce every year. The bottled water industry is one of the fastest-growing on the planet. Last year it made $100 billion, an amount that is expected to double within five years. Now consider the fact that it actually takes the equivalent of three bottles of water to make a single water bottle. Every swig from a plastic blob in the name of convenience moves us closer to a world without any clean water at all. Because like I said before, it’s not about this drought—it’s about every future drought. I don’t like the way my tap water tastes. Filters can help aerate water that’s been sitting in your pipes to make it more palatable and, in some cases, remove contaminants. These ones are cheap. This one looks pretty. You can also buy a fridge with a filter built-in. Here are filters that protect from lead. Buy a SodaStream. They’re not as ugly as they used to be. This one looks like it came from a 1950s diner. They have a nifty new model coming out that carbonates any liquid. What if I don’t agree with SodaStream’s politics? What about those big jugs of water in my office? Maybe they cut down on waste, but they’re still bottled by the same companies you don’t want to support. Isn’t this really about plastic? Kind of. There is some evidence that the chemicals in the plastic bottles might be dangerous when heated. Here’s a better reason to be anti-plastic: Only about a third of plastic bottles are actually recycled in the US, so most of those shiny tubes end up in landfills. What about soda/iced tea/cold-pressed juice in plastic bottles? Yes, technically it takes at least two or three times the amount of water to make any bottled drink (do we really want to get into this again?). But if you’re going to be buying liquids to drink, it’s actually better, from a solid waste perspective, to buy them in cans or glass. Cans are the best: About two-thirds of aluminum cans in the US are recycled and it only takes about two months to get a recycled can back on the shelf. Buy cans of water. They’re less likely to get crushed or punctured, too. I read somewhere that someone died from bacteria in tap water. The US’s water system is the most frequently tested water system in the world. The EPA releases the data from their testing on a daily basis. Boil orders are rarely issued outside of natural disasters; usually quality issues are related to old pipes or private wells (which again, gets into the groundwater problems that bottling water may exacerbate). This is all the more reason to support your local municipal water source, which is working to make improvements to the system that will benefit more people. Also, it’s important to note that about a quarter of all bottled water is just municipal tap water. Isn’t bottled water better for you because it’s filtered? In many ways, tap water is healthier because it contains fluoride, one of the great public health achievements of our lifetimes. Although it has come under criticism of late, instances of tooth decay are much higher in cities and countries that don’t have fluoride in their water. But bottled water is everywhere, how could we possibly get rid of these things? Five years ago you might have said the same thing about plastic grocery bags, which are currently banned in many cities and states. Or maybe it’s more like the anti-smoking laws in restaurants, which have become nearly universal in the US. Many city governments have already prohibited the use of bottled water at public events, for example. Entire national parks like the Grand Canyon have banned the selling of bottled water. The key is to start small but think big. What reusable bottle does Gizmodo recommend? This post was originally published on May 18, 2015. It has been updated with new information about the bottled water ban at Washington University in St. Louis.